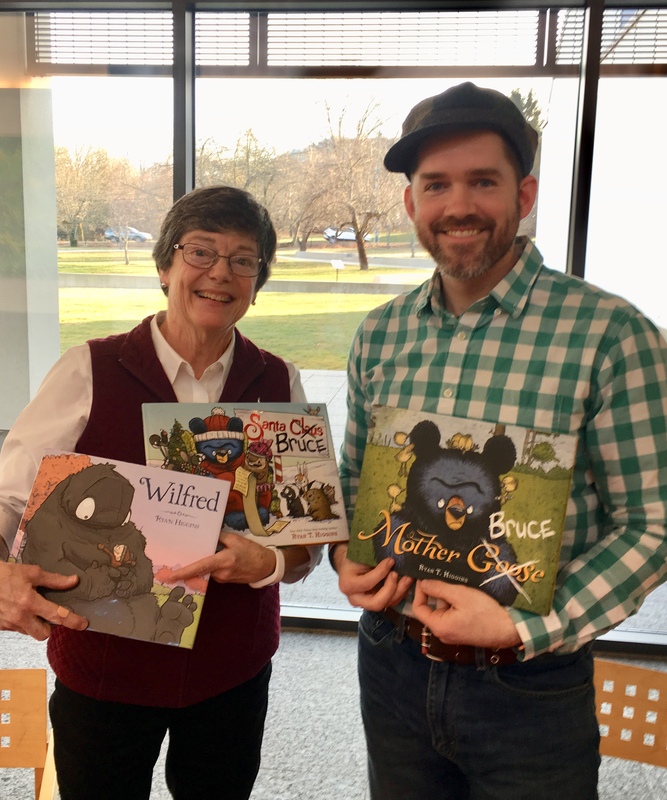 I was fortunate to meet Ryan Higgins, a favorite children’s book author, at the Eric Carle Museum last week. 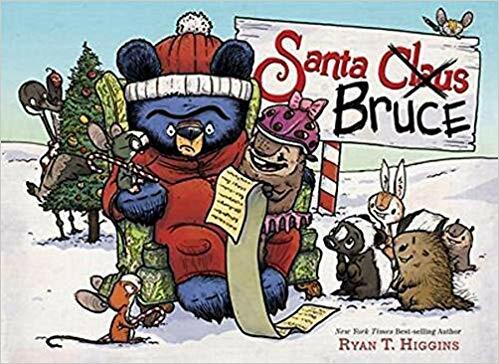 He read aloud his new picture book, Santa Bruce. I’m a big fan of his Mother Bruce books, so I grabbed that chance to meet him and hear him read aloud. Mo Willems slipped into the back of the room to hear him read, too. First, Santa Bruce is a winner! Hilarious with a capital H. And I’m picky about good books. Secondly, Ryan is a very good reader-aloud. Not all authors can wear that reader badge. After story time came the book signing. Addie and her mom were in line in front of me. When it was their turn Ryan immediately recognized the little girl and stopped. He went through his things and pulled out her drawing. I wanted to turn around and scream to everyone in line, Do you see what this man is doing? Do you see how wonderful this is? Do you see that he ‘gets it’? I was witness to a powerful moment. Addie and Ryan chatted away. I smiled and took a picture. When it was my turn I told him most preschoolers can’t make representational drawings. He knew and smiled. I also told him how my students like his earlier book, Wilfred. The event was terrific. He also read aloud his new book We Don’t Eat our Classmates about a kindergarten dinosaur named Penelope (really funny), and drew characters for the children. I didn’t know that the endpaper was actual drawings children had made. Thank you, Ryan T. Higgins! Author Ryan T. Higgins is hysterical. I mean unexpected, fall-down-laughing hysterical. His two children’s books are favorites in my classroom. The storyline is a grumpy old bear who likes eggs, and what happens is imaginative and funny. 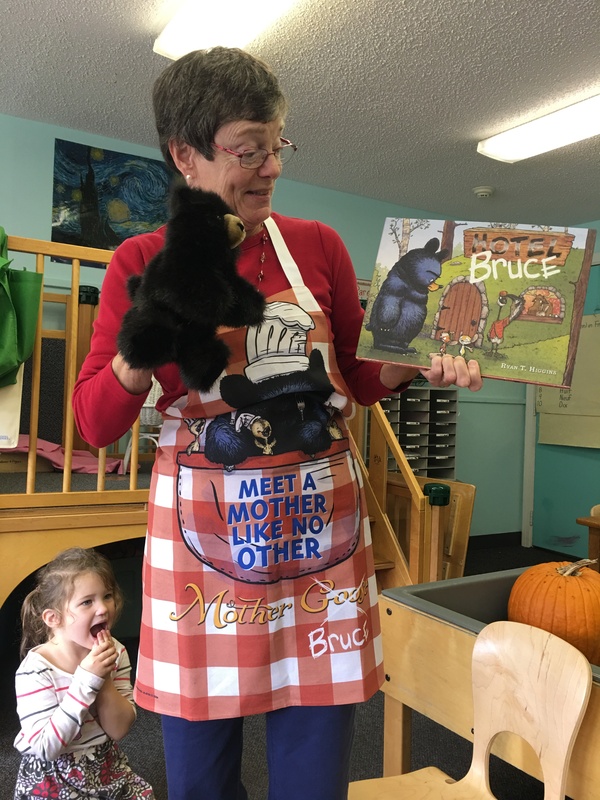 I read Mother Bruce to all my fellow staff at school and they laughed, out-of-control laughing. It was hard to rein them in. Here’s the twist; Mother Bruce and Hotel Bruce appeal to both children and adults. That makes it a delightful read for parents and their children. I remember watching The Muppets on TV with our kids. This show appealed to both children and adults (the two old men in the balcony is a case in point). Therefore, families watched it together. If a book is good enough to appeal to both, that’s a brass ring. Parents will want to read the book aloud, and children will benefit from far more than just a good story. This is the single most important item to ensure that a child will succeed in all subject areas in school. All areas! The more words a child hears, the better s/he will do in school. Period. Wow! That fact changed my life in teaching. I have always loved reading books to children, and then I took the next step; I made sure books in the classroom were front-facing, I read stories with a passion, stopping at every ‘new word’. That was brilliant. We looked up those words in the dictionary (yes, in the middle of reading the story). I read a story at least twice a day, and also whenever a child wanted to read. Yes, they wanted to read. Books were everywhere in my classroom. The more we read together, the more we wanted to read. And, the better the children performed. Morning Meetings became long, sometimes over fifteen minutes, because we had important things to learn- geography, math, science experiments, instruments, famous artists, poetry… there was so much to learn and reading books gave children the focus and vocabulary to absorb it all. That is powerful and cements why I do what I do. 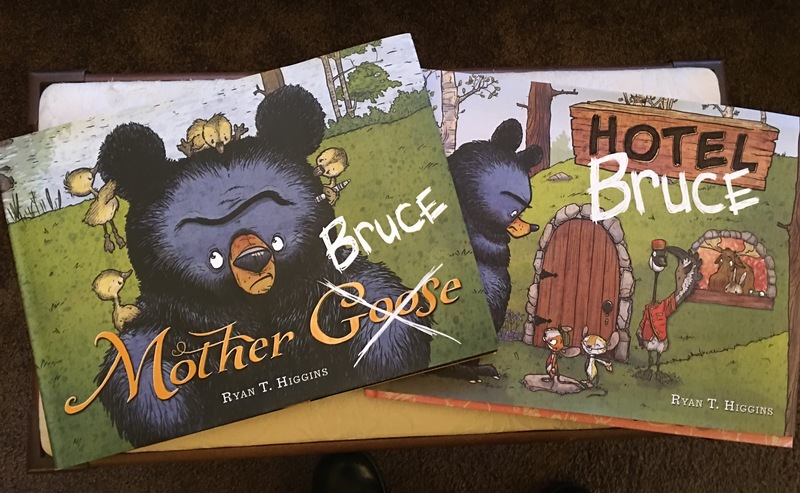 The vocabulary words in Mother Bruce and Bruce Hotel that children were eager to learn are: victim, stern, pesky, migration, creative, reluctantly, hibernate, rodents, commotion, and translator. My children are three and four years old. I doubt many children of this age learn these words. Thank you Ryan T. Higgins for quality literature that appeals to all ages. Good literature is my tool to make a difference. This entry was posted in Book Review, books, children's books, Early Education, museums, picture books, preschool, reading, reading aloud, reading aloud and tagged Book Review, children's books, Early Education, Eric Carle Museum, Meeting an Author, Mother Bruce, picture books, reading aloud, Ryan T. Higgins, Santa Bruce. Bookmark the permalink. You sure get to meet some great people, Jennie. I love what he did! Thanks, Opher. New England has many authors, so I am lucky to meet a few. And yes, what Ryan did was terrific. One day that little girl will be illustrating her own books and delighting the next generation! Thank you, John. He is the real deal. Wow, he sounds absolutely wonderful! He made that little girl feel so special. He is wonderful. Thank you! What a great story and share, Jennie. I just popped over from Sally Cronin’s 🙂 This author really gets kids!! I like the vocabulary he uses and can see why it would appeal to all ages. You sound like an exceptional teacher!! Thank you, Lisa. Sally is the best. And I have to say that Ryan is just what you say – he really gets kids. Humor is difficult to write, especially for children. Ryan nails it! This is such a good story, Jennie. I’m glad you met him, and I am glad he is as nice as he is.talented. I love his bòoks too. He sounds wonderful. What a treat to have met him. That little girl will never forget that occasion. You really do pick quality writers. He is a class act. I love your apron and the puppet you use when reading the story. You are correct about vocabulary. I always used big words with my children when they were very little. No dumbing down a conversation. Now their vocabularies top mine. Of course I’m at the age that words have taken a run for it. 😉 Thank you for such a happy, encouraging post. I haven’t heard of these books… May need to investigate!!! Looking at them, I’m sure I would! Thanks for the new book recommendation, Jennie! Jennie, excellent review. Our twin grandchildren are nearly 26 months and visiting us for Christmas. Are these books appropriate for that age? Probably not. But YOU will love it. Save the book for next year or the year after. Thanks, Steve. I will be posting my favorite Christmas books in a few days, so that might be helpful. Stay tuned! Oh, Jennie, this is such a beautiful story to begin my day! I’m so glad you were a witness to this special moment. I also appreciate reading your description of reading aloud again. I’m a huge believer in pausing during a story to chat about vocabulary, setting or characters, so I love hearing that you feel the same! Thank you so much, Susan. It was definitely a special moment! Oh, you should hear me read aloud. The talking, pausing, reading with a voice, discovering new words… the list is a long one and a good one. I’m so glad you feel the same way!! This gave me goosebumps!! I have to find and read his books! Thanks, Deborah! Your grandson will love them, too. I bought Mother Bruce for two little boys awhile back. I’m so glad you got to meet Ryan! Thanks, L. Marie! It was wonderful to meet Ryan. I have to say that Santa Bruce is as good (if not better) than Mother Bruce. Vocabulary. Too true! My granddaughter is five and it’s a hoot watching her learn to read and write. I hadn’t seen that process for decades. Now that I’m teaching elementary German at the high school level, I find the parallels, the process of learning, fascinating. It is fascinating, Cindy. There are so many parallels with other languages. Enjoy those wonderful emerging reading and writing years with your granddaughter! I think this is fascinating, Robbie. And I wonder why children’s books across the oceans aren’t known to each other. Thank you for your wonderful post! 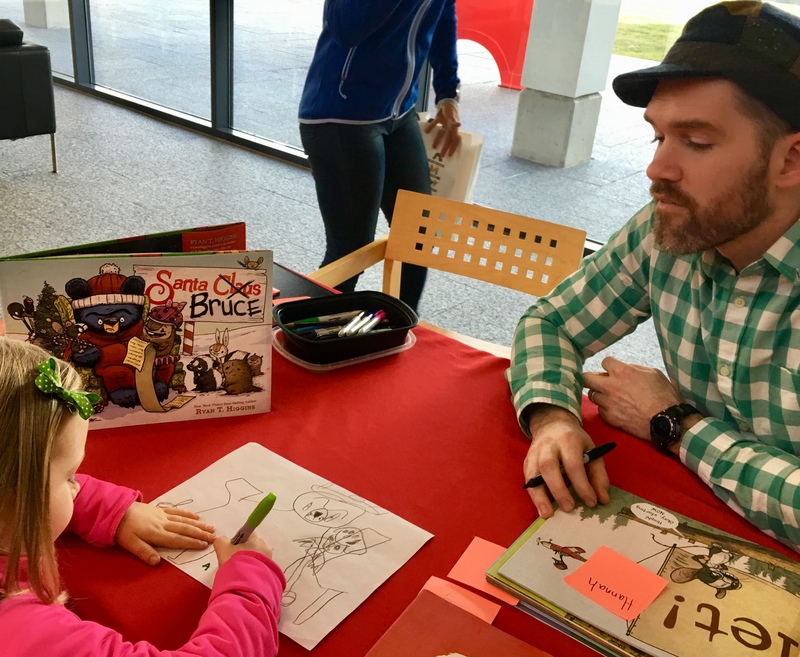 I work at The Carle and get to witness truly amazing moments with artist and authors, and I fully agree with your sentiments about Ryan Higgins and his books, and the importance of vocabulary, and stopping to research and discuss new words. What a great gift you are to children! Thank you for all you do! Thank you so much, Rebecca! You are lucky to be witness to many events with authors and illustrators. I feel especially lucky to be there for a few. I’m so glad you enjoyed this post. And thank you for your kind words! Hi Jennie, Thank you. What a great introduction to a children’s writer who seems to know his onions (whoops a cliche…). You too! Although at a basic level, I helped a few children with their reading years ago, and in one case – when I thought one poor lad wouldn’t make the grade – he later surprised me, went to University, won a few prizes for his stage-designs and wrote thanking me for my patience. I was so thrilled that he had made it! As a professional teacher, you must find it very satisfying and pleasing when you hear of success stories. Reading is often the key Best wishes.. Thank you, Joy! I have discovered after all these many, wonderful years of teaching that reading is absolutely the key. It gives children everything. I am lucky to be on the front end, before they can read independently, and read aloud. Meeting those authors that write good books is a big treat for me. I love your story of the boy who made it, because you never gave up on him. That is enormous!! As I shared in blogs, how amazing children can be, that they see so much as we do, but that part of them is not often encouraged in the effort to teach curriculum and raise test scores. Perhaps, had we been encouraged, we might have found talents and interests earlier in our lives. Though I taught all subjects, in writing, I encouraged play and story writing (with panels, character descriptions, scene details after they had written in their own methods), many reading their projects before the class, some acting out the scenes. I loved it when they would come up with something I never thought about before but was creative and brought forth something that was within. Teaching is not just about teaching, but what is brought forth when some freedom of expression is encouraged. Thank you. “Perhaps had we been encouraged…” says it all. Few of us were truly encouraged. It’s how it was back then. Unfortunately many teachers today are so stretched with meeting standards, testing, and high numbers of children in the classroom that they can barely do their job, much less truly encourage children. Freedom of expression can be more important to a child than the lesson at hand. I, too, do play performances with children, and love it when they have their own ideas. We’re gearing up for a play of The Story of Little Babaji, one of the best books. Thank you for your thoughtful and kind and inspiring comments. Part of the reason I taught was I really couldn’t remember one teacher that encouraged me, save one or two comments, and so I wanted to make sure I told all of my students that I believed in them. Jennie, this is a delightful post. I love the way you drew attention to the way Ryan was validating and empowering Addie. I am not certain how much of the event she’ll remember, but I’m certain that she’ll remember the way he made her feel, and that will have a lasting impact. Words are powerful. We need to use them generously and wisely. Thank you, Norah. Ryan’s focus on Addie was genuine and empowering. I thought the same thing – she may not remember the words or much of the event, but she’ll remember how he made her feel. Maya Angelou said that, too! I think I was thinking of Maya Angelou’s words. I’m sorry I didn’t know of her until after she was gone. Fortunately her words have been captured and make her immortal. Her words were in your mind, and that’s probably why you said them. You think and feel the same way, too.